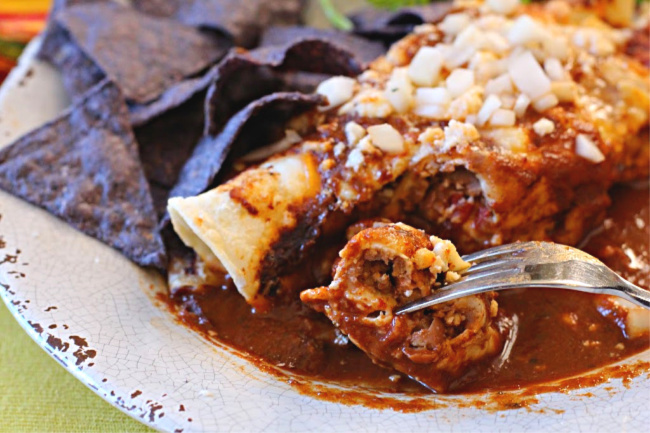 Enchilada Burritos are an easy beef and bean burrito recipe where a flour tortilla filled with seasoned ground beef and refried beans and smothered with some of the best enchilada sauce you’ll ever taste. Pet Peeves. We all have them. Slow cashiers, chronically late people, people who don’t pick up their feet when they walk, people who cut in line… people who talk on their cell phones while at the check out counter…delaying everyone, including the slow cashier. Well here’s a biggie for me. People who call a recipe an enchilada when it consists of chicken, beef or cheese, or any food for that matter, wrapped in a flour tortilla, smothered and baked. I see it all the time. If it’s in a flour tortilla, it’s a burrito. Enchiladas are food wrapped in a corn tortillas. Plain and simple. So why am I calling these burritos Enchilada Burritos? Because I wrapped seasoned ground beef, refried beans and cheese in a flour tortilla and smothered them with some of the best enchilada sauce I’ve found. So easy, so simple. Very addictive. 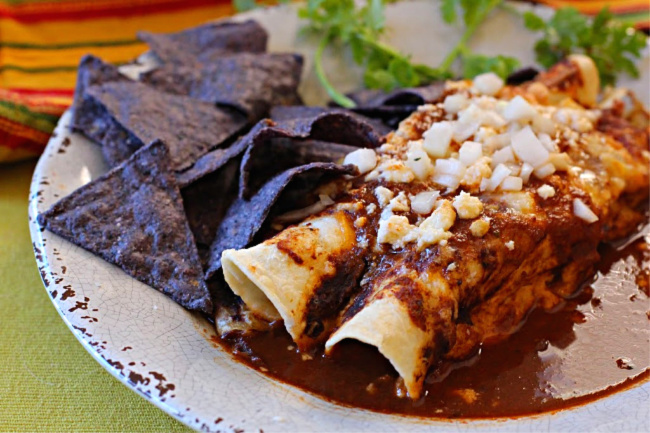 Make a batch of Homemade Enchilada Sauce. Set aside. Or use your favorite canned variety. You’ll need three cups. Brown one pound lean ground beef. 90/10 meat to fat ratio is good here. Add onions, taco seasoning and water and cook twenty minutes, or until sauce thickens. 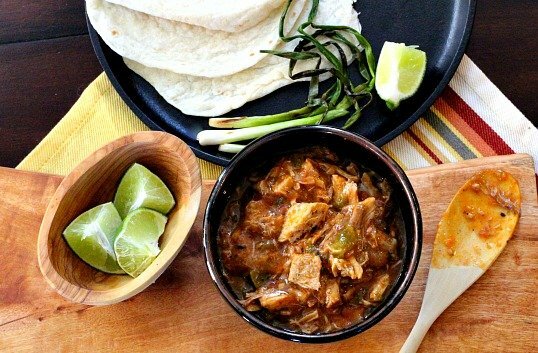 Open a can of your favorite refried beans. We happen to prefer Rosarita. Open a package of flour tortillas. 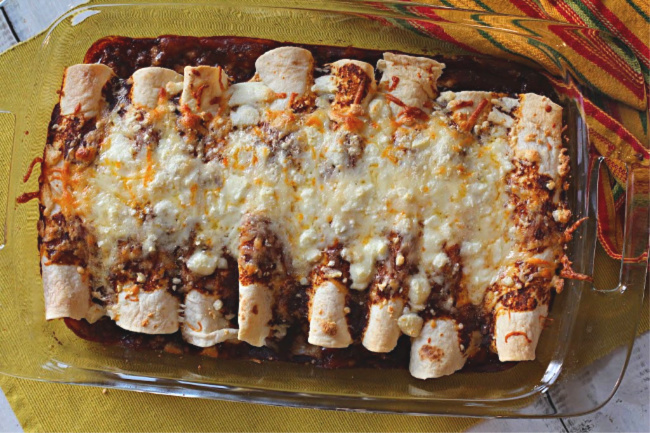 Pour 1 1/2 cups enchilada sauce over the bottom of your 9 x 13 casserole dish. Microwave flour tortillas for about one minute. This makes them easier to roll. Lay a flour tortilla flat on a plate. With a spoon, spread on about a tablespoon of refried beans. Roll up the tortilla and place seam side down in the casserole dish. Repeat until all tortillas have been filled. Pour about a cup more enchilada sauce over the filled tortillas. And top with more grated cheese. Bake until steamy and cheese has melted. Sprinkle with raw chopped onions and grated Mexican crumbling cheese. The crumbling cheese is optional, but it adds a nice salty and creamy texture to finished burrito. The result is a soft baked flour tortilla drenched in a robust sauce, cheesy, beefy and as Southwestern as you can get. I hope you give this easy beef and bean burrito recipe and try and if you do, please come back and give the recipe a star rating. I value your opinion and love hearing from my readers. And if you have a favorite easy burrito recipe, please let me know, I’d love to give it a try. 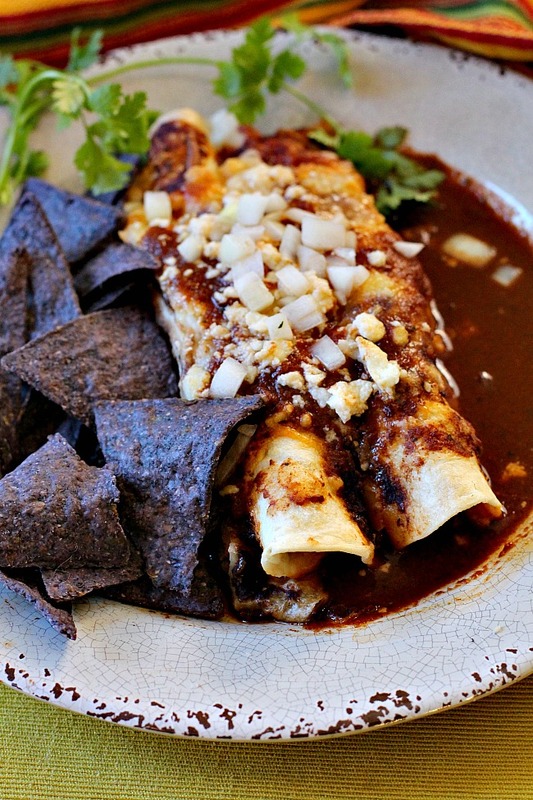 These Enchilada Burritos are a very straight forward burrito. An easy beef and bean burrito recipe where a flour tortilla filled with seasoned ground beef and refried beans. Add lots of cheese and enchilada sauce. Heat a skillet over medium high heat and add ground beef. Breaking the beef up with a spoon, add onion after a few minutes. Drain grease if necessary. Add the homemade taco seasoning and water. Cook on medium heat until mixture has thickened and water has absorbed. About 10 minutes, stirring occasionally. Meanwhile, empty refried beans into a bowl, with a large spoon, slightly flatten out the beans so they'll heat more evenly. Microwave the beans until just warm so they'll spread better. About 40 seconds to 1 minute. Ladle 1 1/2 cup of the homemade enchilada sauce on the bottom of a 9 x 13 casserole dish. Lay a flour tortilla on a plate. With a spoon spread a heaping spoonful of refried beans on the tortilla. Top with about 1/4 to 1/2 cup of the ground beef mixture. Top with a couple of heaping tablespoons of grated cheese. Roll up and place seam side down in the enchilada sauce in the casserole dish. Repeat until burritos are filled. Depending on how much bean and beef mixture you use for each, this could be 10 - 12 burritos. 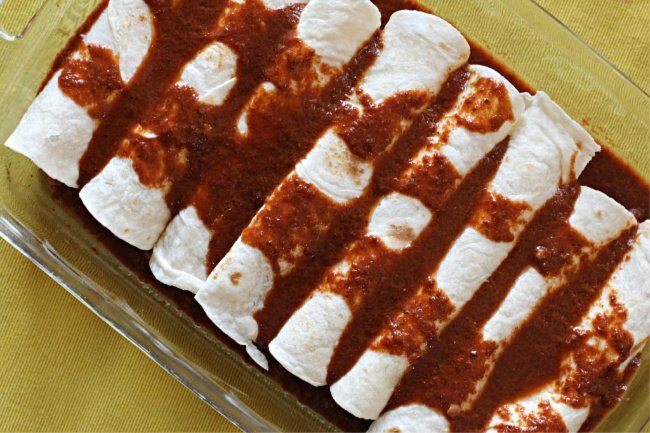 Drizzle the remaining enchilada sauce over the burritos and sprinkle with additional cheese. Add Mexican Crumbling cheese if you wish. Bake 350 degrees or until all is bubbly and heated through. They look delicious and I have almost done the same rant and have to hold back on commenting on others post. 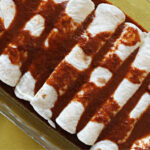 It seems that some think that if it goes in a pan with sauce, it’s an enchilada regardless of the tortilla. I plan to use your sauce at Thanksgiving. 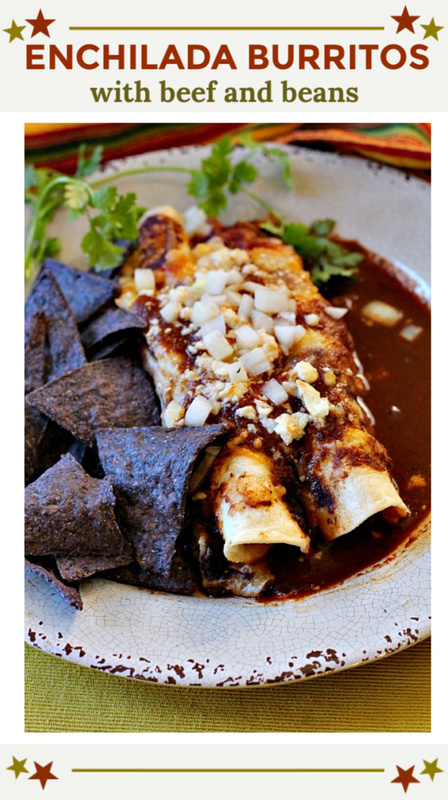 I am excited to try your enchilada sauce and recipe, Lea Ann! My mouth watering! Now I must know about your homemade enchilada sauce too! Headed to check out that recipe now. 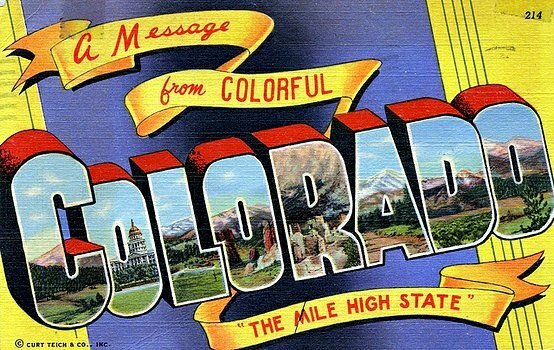 I’m so glad you said it! Homemade enchilada sauce makes all the difference in the world! Craving Mexican right now! Oh yes, there have been a few of these enchiladas on my dinner table as well. 🙂 It’s hard to be a few beef and bean enchiladas smothered in red. Great platter of enchiladas Lea Ann!